There may be times when a dental crown becomes necessary. This can happen when a tooth has become weak due to decay, lost a large filling, has undergone root canal therapy or sustained damage in an accident. 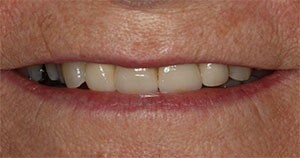 A crown adds strength and restores the tooth to its former function and appearance. Dr Luke Rickman uses advanced expertise gained during his Master of Science degree in Prosthodontics (restoring and replacing teeth) to ensure ideal outcomes. This ensures that patients’ crowns fit precisely and have optimal appearance, function and longevity. Many health problems can result if you are missing one or several teeth. Not only do missing teeth have a negative affect on chewing ability and appearance of the smile, but it also causes remaining teeth to drift out of alignment. Poorly aligned teeth can lead to bite problems and are more difficult to clean increasing your risk of gum disease. 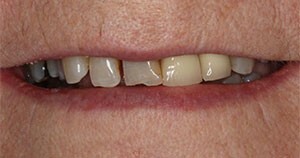 A bridge is an effective non-removable solution for replacing missing teeth. It involves the careful preparation of a neighboring tooth (or teeth) to support a fixed ceramic prosthetic to return form and function to your smile. Dr Luke Rickman works closely with a master dental technician in the neighbouring suburb of Richmond to ensure all ceramic work is of the highest quality.